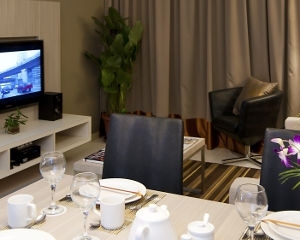 Set in the culturally rich city of Kuching, Citadines Uplands is located in the prime location of Jalan Simpang Tiga, a hub for education and local federal government administration offices. Across is The Spring Shopping Centre, one of the largest shopping malls in East Malaysia, and this strategic location provides a quick 10-minute drive to the Samajaya Free Industrial Zone. At Citadines, you have the freedom to live the life you want by choosing from a range of services and amenities that best complements your lifestyle and budget. It’s furnished apartments are designed with separate living and dining areas to provide you with ample space to live, work and entertain. By Taxi: Purchase the taxi coupon/ticket from Airport Taxi Counter which cost RM26 nett per car per trip and it takes 15 minutes to reach the property.